Choosing the right color can be a difficult task. Think of color as a form of nonverbal communication. Color can help portray a message. It can contribute to evoke an emotion. Color can impact how we, as consumers, think and behave. Did you know many businesses use a particular color as a form or persuasion and promotion? There have been countless studies conducted that have helped identify how different colors have a unique effect on consumers. Before you get started on your next animated presentation, take a look at how the color wheel can actually be used as a persuasion tool. Red is a dominant color. The color gives off a high level of energy and can immediately grab your audience’s attention. It can be used to show strength but can evoke anger and frustration at the same time. Are you looking to create a sense of urgency? Fast food restaurants are known to use different shades of red to appeal and grasp their audience. If you are trying to lift your audience’s spirits, then yellow is the color to use. The yellow color palette almost always epitomizes happiness. Did you know yellow stimulates the logic center of the brain and can promote enthusiasm? That being said, too much use of the color yellow can actually lead to anxiety. Finding the right balance of yellow in your video presentation is crucial! Blue is arguably the safest and most dependable color. Blue is the most universally loved color and psychologically gives off a relaxed feel. Blue tends to be used amongst corporate brands and companies looking to promote trust as a key element within their brand. Before you start creating your presentation, think back to what your goals are and what you are talking about. If your video is about health, travel or relaxation, a lighter blue might be more suitable than a darker blue, which is more commonly used in politics, religion or legality. Green is another safe color to use for any business or within video presentations. If your next animated presentation is about health or the environment, then green is an obvious choice. That being said, green is also associated with money and wealth. The green color palette is known for stimulating harmony in the brain, leading to more certain decisions. Brown is a more serious color. Companies would use brown in their video presentations to give off a more attainable and approachable look. The brown color palette tends to be more accepted by men rather than women, so before you choose it as your primary presentation color, think carefully about your audience! On the contrary, purple is a warm color, associated with wealth, wisdom, and extravagance. Although the purple color palette is frequently used for beauty and anti-aging products, more and more people are identifying the color with innovation and creative brands. Pink relates to compassion and hope. Charities worldwide commonly use the color pink as part of their marketing efforts. That said, pink also represents a sense of softness and sweetness that can be applied the beauty, fashion, cosmetic and confectionery industries. Before you use the color pink, think about the message of your animated presentation. Pink works best when you are trying to evoke positive emotions rather than negative ones. In psychology, black means authority and control. In marketing, black can help add luxury and elegance to an item. The youth market is attracted to the black color palette, with many businesses opting to use the color to sell their product or service. Are you looking to create a dramatic effect in your next video presentation? Use black as your primary color with blends of rich, bright colors, such as red, yellow or orange. At this point, white is one of the trendiest colors in marketing and presentations. Much of this can be credited to Apple’s sleek design, with many other companies following suit. White is a clean color. It’s calming, simple and efficient. That being said, using white on its own in your next video presentation runs the risk of being sterile and boring. 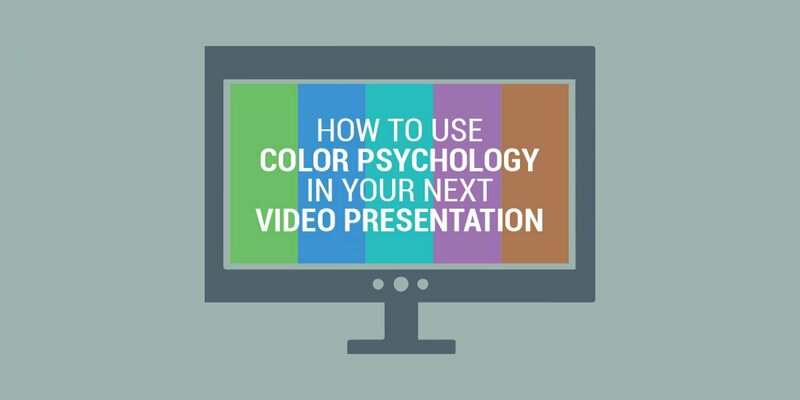 Simply choosing a random color for your video presentation can actually damage your efforts to persuade and influence your audience. Having the right color is equally as important as having important information to present. Although some may see it as a small aspect, color psychology is critical should you want to get the best results. Now that you have a good understanding of the color theory, you need to learn how to apply it. Don’t just select a color palette based on your preference. Test out a few color combinations and check which ones work best. If you need an audience for you to test your presentation on, we are always here!